As a woman in STEM, I wish this statement were true. But it’s not. And pretending it’s true invalidates the effort needed to make it true. As a scientist and logical thinker, I know the first step to solving a problem is to clearly define it. It is a daily effort to combat the biases I know I have. Those in denial of having bias are clearly not combatting it. There are many leaks in the pipeline leading to a gross underrepresentation of women promoted to the rank of full professor in academic research. This hovers at around 20% for life sciences and is below 10% for math, computer science, and chemistry. Even when controlling for productivity, women are more than 50% less likely to be awarded tenure. See also a more recent study suggesting the same challenge, and this blog: ‘Tenure, she wrote’. The size of the gender disparity strongly suggests it cannot be explained by a lack of input (i.e. females entering STEM fields) at the graduate school level, or even tenure-track level, which have both achieved the ~50% mark. So, what is the rate-limiting step for seeing women ascend to the highest ranks of academia? 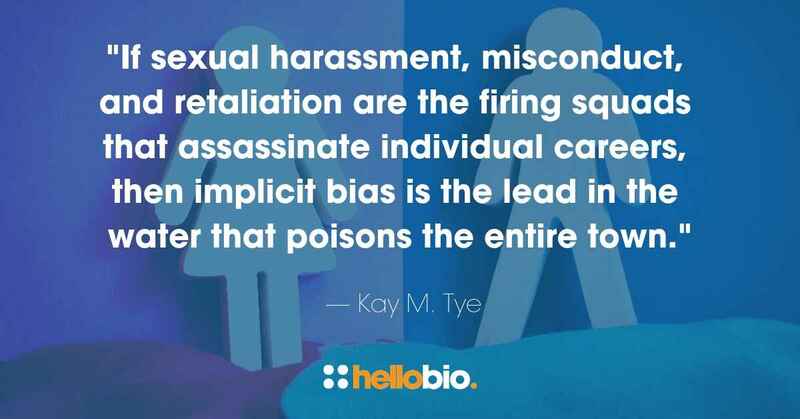 Perhaps the greatest contributing cause of the underrepresentation of women in STEM is the epidemic of gender bias, gender harassment, and retaliation – a discussion brought to the forefront by BethAnn McLaughlin and #MeTooSTEM. I respect and admire my colleagues with the courage to speak out on this topic, which I am only brave enough to touch on briefly. This movement has been so successfully championed that I want to focus here on another rampant problem that lies cloaked under the surface of our own consciousness: Implicit Bias. Bias is a widespread reality. That’s right, folks. I, a scientist, am voluntarily admitting to having bias – which is the antithesis of what I should ideally stand for in my profession. So, I will not crucify anyone for having bias. I will challenge individuals for the denial of having bias. Indeed, the strongly negative connotations associated with the word “bias” – particularly in scientists and others in professions that hold truth, justice, and integrity as core values – is in itself a problem. Bias is a problem, but if people are so terrified of accusations of being biased that they can’t be rational, it squelches any productive dialogue. In behavioral neuroscience, this concept is closely related to stimulus generalization. For example, if we were attacked by a lion, we would rapidly learn to fear and avoid lions. The same would be true if we watched someone else be attacked by a lion, even if it was on TV (though to a lesser extent). If we then saw a tiger for the first time, we should also fear and avoid the tiger, given its similarity to the lion. Across millennia, our brains have evolved to help us survive. Brains that failed to do this job became discontinued models. So, this is a normal, adaptive brain function that is well-conserved across species. When we apply heuristics, or models for stimulus generalization, based on our past experiences incorrectly, then we have bias. When we look at the legends of fields dominated by a subset of the population that looks a certain way, we are forming associative memories. How is it possible that I, the daughter of a successful woman scientist, who is also a scientist herself, has a bias against women in science given my unique previous experiences? When we are all socialized based on the same historical data, and have access to the same popular TV shows, media, news and internet memes – then heuristics are assimilated, and the same biases can be applied. The ambient socialization we all undergo is amplified by the data we collect each day as underrepresented demographics. Stereotype threat, a well-researched phenomenon, is exemplified when you see successful scientists with certain features (e.g. male, white) over and over again, and you begin to associate being a successful scientist with those salient features. In an informal social media poll, 41% of women in science said they recalled being the only woman in a room of 20 or more people. Anecdotally, in personal conversations with black scientists, it is common to be the only black person in a room of 200 or more (e.g. conferences, medical school classrooms) – so the problem of stereotype threat is much more severe in racial minorities. Personally, I don’t recall having this experience as a trainee. Though I may not have noticed if it had occurred, because I also had biases. Although I did actively seek out female mentors (and found extraordinary, inspiring ones), I was often surrounded by male colleagues. I want to pause here to stress that by and large, I have had fantastic male mentors and male colleagues who have listened to, respected, and supported me throughout my life and career. My oddly formed cognitive dissonance about being the person I am in the world I inhabit has become clear to me on a few occasions. My former student, Stephen “AZA” Allsop now faculty at Yale, organized a seminar in our building on the topic of stereotype threat. Eager to support him as his mentor and as a representation of our faculty at MIT (I did not see any other faculty in attendance), I got there early, sat in front and paid my full attention. At the beginning of the seminar, the speakers asked the audience to raise their hands if they identified as being a white man. Trying to show faculty support, I raised my hand nice and tall to show my engagement in this exercise and my unqualified support for my trainee – only to realize in horrific embarrassment a few hundred milliseconds later that I am neither male nor white (I am female and Asian!) I quickly put my hand down and turned bright red for a few minutes, only to spend the next few years contemplating my identity. The purpose of this poll was to show that black or white, male or female, we all have biases for associating white males as being in positions of influence and power, while associating being black or female with other traits. Implicit bias tests can be taken at home, and exist for many different types of biases. In the summer of 2016, pre-tenure and post-partum, I organized an inaugural meeting of what I hoped to be a successful series that I founded and co-chaired. My tenure evaluation was slated for the following year, and I had just had a baby in early 2016. Having representation of female speakers at the meeting was a priority, but having a meeting that senior colleagues (the ones determining my future job security) viewed as “successful” was a higher priority for me at that time. “What do you mean?” I was shocked at the accusation. I didn’t have gender bias!? I was a woman scientist with a successful scientist mother, who had been trained by a woman scientist – both of whom I idolized. How could I be biased? She noted that I had only had 11 women out of 40 speakers, of which four were trainees. “A lot of women we invited declined,” I replied. “Yeah, but that’s because everyone sees the top 1% of female scientists that are super famous, and invite them to everything. But then the many women scientists that are equally as good as the men that are speaking are just ‘invisible’ to you,” she said. As it turns out, the meeting I organized met the “base rate” for women in this field, which was estimated to be roughly 24%. We had 27.5%. But I was acutely aware of how correct my colleague was to point out my bias against women in science. Why isn’t the “base rate” 50%? This was the moment I realized I was part of the problem. I was making it harder and worse for myself, and people like me. In a desperate attempt to “fit in” I was abandoning my own identity group. Unfortunately, this type of behavior is not uncommon. “Ladder pullers” exist for many disadvantaged groups, and fail to use their positions of power to help remedy the injustices they themselves have faced. Shortly after, I found an interview by Yael Niv that I found eye-opening and helped me realize my own bias in a fully-formed epiphany. For me, this is a must-read that resonates on many levels. Yael Niv mentioned how discussions about potential female speakers / awardees / hires could come down to saying things like: “She’s too junior” or “She isn’t rigorous enough.” Or that women, particularly Asian women, are seen as too aggressive or overconfident just because the default expectation is that they should be sitting quietly in the corner. One conversation with a colleague who cared enough to confront me helped initiate a transformation in me that was fully crystallized by the sequence of events that led to the 2016 election outcome. What happened in November 2016 was a brutal wake-up call for me, and made it abundantly clear that there was still work to do in the quest for gender parity. This took some courage, because I had not fared well on previous occasions where I was interviewed about motherhood in science when I was pregnant with my first child. I was told I would “be a horrible mother” or “wouldn’t be smiling in five years” – though to be fair this interview took place before my ‘Bias Awareness Epiphany’. For the very first time, I spoke publicly about gender bias and sexual harassment. I spoke about how I had been sexually harassed by a postdoc as an undergraduate researcher, how the PI didn’t believe me when I reported it (despite there being multiple witnesses), how I lost my letter of recommendation and my authorship on a paper – jeopardizing my admission to graduate school, and almost left science. It was the first time I had told this story since a well-intentioned senior male colleague advised me to “never tell that story again” because it made me sound “crazy.” Only later, when I was empowered by the #MeToo and #MeTooSTEM movements, and learned what “gaslighting” was, did I feel it was possible to talk about it again. I also made the analogy between recognizing bias in the world around you and the classic optical illusion, two faces and a vase. When I had bias but was unaware of it, I simply could not see bias in the world around me, just as a naïve observer might just see the two faces without seeing the vase, or vice versa. But once you know it’s there – the illusion – then you can decide at will to perceive either the two faces or the vase. And you will never be fooled by the illusion again. Is it really harder to be a woman in science? So… yes. IMHO, it is harder to be a woman. But I didn’t always think so. At one point, when I was a postdoc on the faculty job market, I held the belief that there was a net advantage to being a woman. I still see advantages, though I now see them as grossly outweighed by the disadvantages. The affirmative action. The soft quotas. The committees I sat on were enlightened enough to realize we needed to count the number of women and underrepresented minorities, if not in the name of doing what’s right, at least in the name of reporting to funding agencies. My peer colleagues (senior postdocs or junior faculty at other institutions across the nation) would tease me that I was lucky to be a woman. They did not intend for this to be an insulting comment, and I was so similarly biased by the same cultural socialization that I laughed along with them and agreed! Yup, I would think: “Good thing I’m a woman, otherwise I wouldn’t have sailed along so easily and gotten this award / grant / paper / job!” At the time, this would come up frequently, almost any time I spoke about the job market and what I was up to or doing next. I wasn’t intentionally being fake. Under the heavy armor of my own bias, I uttered these toxic words as casually as if we were talking about the weather. At the time, it was not upsetting. It was just… normal. Women were undeniably underrepresented in my area of research, and in most departments I was applying to, so it made perfect sense to me that those making hiring decisions would consider my application more carefully in an effort to promote diversity. Indeed, as someone who has sat on the other side of selection committees, diversity issues come up in every meeting -- as I believe they should. It’s not precise, but we take a moment to note the pool partway through the process and if it is going well (diverse pile at the top) then no interventions are made. Sometimes it is embarrassingly biased, with 0 in 8 applications ranked thus far being female. So, then we take that into consideration… heavily. My rationale is that we need to evaluate candidates based on their future potential. We should be hiring for slope, not y-intercept. If someone has overcome countless disadvantages accumulated across a lifetime, does that not speak to their potential? In grant proposals to the NIH for scientific meetings, we are to indicate the junior, female and URM individuals to show we have diversity. These policies that come from the top help implement real change, but they won’t be maximally effective without a grassroots movement to meet it in the middle. There’s nothing wrong with being aware and taking the data. But when we begin discussing quotas, it once again puts the focus back on gender and race, instead of the professional accomplishments of the individual. Now, let’s come back to why the practice of attributing one’s accomplishments to their minority demographic is toxic and unhealthy. By saying these things, I was suggesting that if I was not a woman, then I would not have been hired on my own merits and my performance. Women are not as good as men, and they need a little boost. Women that you see are only there because they got a boost. Women should most fiercely compete with other women for that token spot. Each of these implications poisons the spirit of the marginalized and underrepresented, and may apply to many other minority groups and non-binary gender identities. The slightest nuances in policy making and enforcement can transform the outcome from the intention with which it was seeded. If quotas are not implemented, will the numbers ever change? And if they are, then everyone who may be helped by them will be second-guessed by their peers. Policies that come from the top are essential, yet the implementation of affirmative action and hiring quotas is a double-edged sword that can further punish those these policies attempt to help. The solution? These policies and strategies need to be supported by a widespread change in attitudes and biases. Changing perceptions, and promoting #BiasAwareness one conversation at a time, is an empowering strategy that we can all add to our growing arsenals in the fight for gender parity. Given that even teaching evaluations from students reflect biases, we also need to begin working on the bottom up. Let’s populate our most prominent figures (those winning awards, speaking at conferences, in positions of power or in leadership roles) with a diverse group to tap into the talent and creativity of a more diverse and inclusive community. So, for a practical plan, let’s check our personal biases even in casual conversations. Let’s point out the personal biases of others in a constructive tone. Let’s educate as many people as we can about the facts. Let’s share our unique experiences to give people the chance to empathize. Let’s correct each other when we assume an anonymous reviewer was male. Let’s count the women. Let’s create and use a vocabulary that acknowledges the near-universal existence of personal biases about gender and race. Learning about words like “mansplaining,” “gaslighting,” and “ladder pulling” immediately incorporates marginalized perspectives into our consciousness and help normalize what might otherwise be soul-crushing experiences. When I learned these words, it made me feel like I wasn’t alone – and that helped. A lot. Teaching others about this evolving vocabulary may help create empathy for experiences they may never have had. 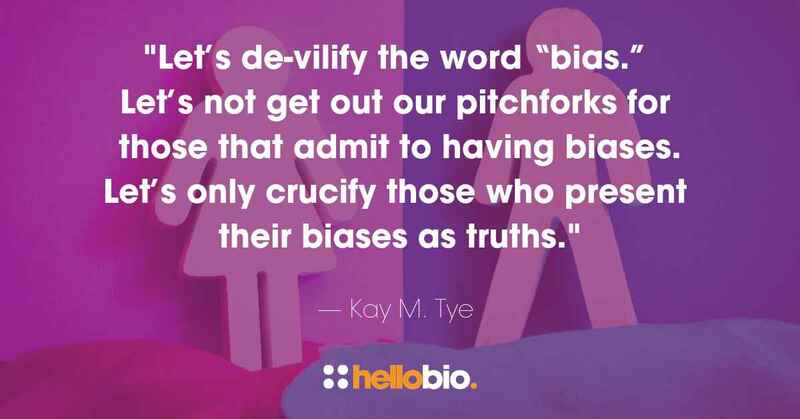 Let’s de-vilify the word “bias.” Let’s not get out our pitchforks for those that admit to having biases – let’s only crucify those who present their biases as truths. Kay M. Tye is a 37 year old American neuroscientist and Professor at the Salk Institute, previously an Associate Professor at MIT. Her research is focused on understanding the precise neural mechanisms that give rise to emotional and social processes. In 2013 she received the NIH Director’s New Innovator Award, in 2014 she was named MIT Technology Review’s Top 35 under 35, in 2016 she received Society For Neuroscience’s Young Investigator Award, and in 2017 received the NIH Director’s Pioneer Award. She was a founding chair of the Optogenetics Gordon Research Conference and the current chair of the Amygdala Gordon Research Conference. Importantly, she has also received awards for her mentoring at the undergraduate, graduate and postdoctoral level. She is a mother of two and enjoys dancing, being outside, and being active. If you enjoyed reading this article, why not check out the other resources available on our blog. As well as trying to promote diversity in science, we're passionate about supporting early career life scientists and PhD students - with affordable reagents and biochemicals, travel grants, and resources to help with both personal and professional development. We know how tough it is - so we hope you find these helpful! Try our Molarity Calculator: a quick and easy way to calculate the mass, volume or concentration required for making a solution. Click below to see our Mini-reviews, Pathway Posters & Product Guides: a set of technical resources to answer your questions on a wide range of topics and to help you get started quickly. Hola. Saludos. Me parece mal enfocado las conclusiones de su estudio. Es cierto que hay mayor cantidad de hombredinero que mujeres en las profesiones vinculados a la ciencia, pero no por ello debemos creer que es a causa de un sesgo de género, ya que existen otros estudios que indican que tiene que ver con las preferencias que la condición como varón o mujer influyen. Hablo de principios biológicose. Con mi mayor respeto, creo que no ha entendido el significado del artículo, no es el sesgo de los demás, sino el propio. Thank you Kay, for a such a beautifully written, honest and eloquent article - I really hope it does stimulate some much needed open, respectful debate in our field! This article has been a real wake up call for me. As a white male I spent my whole life in research and had many an opportunity to collaborate with female colleagues. Both as a graduate student and as a post doc I never came across male colleagues who uttered rubbish of the type Dr Tye heard during her award ceremony of the Young Investigator Award. What kind of upbringing does a male scientist get that gives me the right to tell another female colleague AS A JOKE that she may have gotten this award because she did something so degrading just to get this honour? It is just shameful and make me feel guilty for all these morons who do not see the person but only concentrate on the gender or the religion or the colour of who they speak to. In my professional life I had the pleasure to collaborate with other female scientists and I can only say that with the exception of only one, all these female colleagues were exceptional in their jobs and it was my pleasure to have such an experience. In most cases female colleagues (engineers and scientists alike) they were the more rational elements in the group and a the more positive influence in the decisions that were taken, than the male colleagues. Male scientists and engineers tend to be more arrogant, with bigger egos than deserved and I have to admit this is my bias. There is no proof offered of bias. That in of itself is unscientific and biased. Thanks Kay for this brave, inspiring and honest blog! Your stance of acknowledging your own biases, with examples, gives a great opportunity to engage everyone with this crucial discussion rather than creating an 'us' vs 'them' immediate defensiveness.